From the Editor: Curtis Chong has been a strong advocate in the many states in which he has lived. He is best known for his work with technical issues, having for a long time served as the president of the National Federation of the Blind in Computer Science. He now works in the state of New Mexico as the manager of assistive technology at the New Mexico Commission for the Blind, where he continues to push for nonvisual access in education, recreation, and employment. Whenever blind Americans participate in a local, state, or federal election, we have been able to use voting machines at the polls which (if not as helpful as we might like) afford us the opportunity to mark our ballots in secret without anyone having to know whom we have voted for. But if we want to vote using a printed absentee ballot, those of us who do not see well enough to fill out a printed form must necessarily rely on the help of someone else to mark the ballot, meaning that our ballot is no longer truly secret. In the fall of 2014, blind voters in the state of Maryland, for the first time in history, were able to cast a truly secret absentee ballot through the use of a fully-accessible online ballot marking system. They logged on to a secure website using the access technology of their choice, marked the ballot using an accessible web form, downloaded the appropriately marked ballot to their computers, printed the ballot, and mailed it in. This significant achievement, which would not have occurred without the hard work of the National Federation of the Blind, clearly proved that technology could be used to make the absentee ballot fully accessible to blind voters. Members of the National Federation of the Blind of New Mexico were inspired by this exciting development in Maryland, and so, at the organization’s 2015 convention, the membership unanimously adopted a resolution which declared that the time had come for the printed absentee ballot to be accessible to the blind of New Mexico and for the state of New Mexico to have an accessible online ballot marking tool of its own. 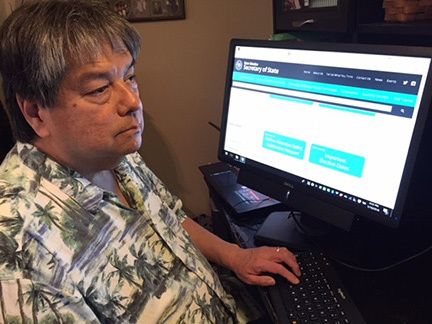 This was only the beginning of a long, three-year process—a process which has resulted in an accessible online ballot marking system which is having its debut for the June 2018 primary election. Three things happened to make all of this possible: First, the state of Maryland was willing to give its source code away for free, meaning that software could be deployed in New Mexico without the costly effort of writing an entirely new system. Secondly, the blind of New Mexico had two champions in the state legislature. They were Representative Tomás Salazar and Senator Daniel Ivey-Soto, both of whom cosponsored the necessary enabling legislation and worked energetically on our behalf. Last but not least, we found an incredible ally in the person of Maggie Toulouse Oliver, New Mexico’s Secretary of State, who testified publicly and enthusiastically in support of the legislation that would give us the accessible online ballot marking system and who inspired her office to work closely with the organized blind to ensure a smooth implementation. Once the application has been verified and approved, the county clerk mails a packet of two envelopes to the blind voter. A smaller envelope is meant to hold the ballot, and the larger envelope contains the smaller ballot envelope and a signed and dated voter certificate. While the blind voter might need some help to sign and date the voter certificate, there is no need for anyone to see the printed ballot before it is inserted into its own envelope. Once the envelopes reach the county clerk’s office, the ballot (in its sealed envelope) is immediately separated from the voter certificate. Thus, no one thereafter will know who marked the ballot in the first place. All of this does require the blind voter to have a working email address, a computer, and a printer. Moreover, the blind voter must be reasonably proficient with navigating through web pages and filling out online forms. While there are those who might complain about this, the reality is that in today’s technologically-oriented world, these are the basic essentials for any online activity. The important thing to keep in mind here is that through our own organization, the National Federation of the Blind, we have proven that the printed absentee ballot can be made nonvisually accessible and our right to a secret ballot thus maintained.